The visa situation seems abnormal for yet another reason. Russians can travel without visas to 110 countries. In 2017 alone, Russia signed agreements on reciprocal visa-free travel with the UAE, South Africa, Myanmar, and Samoa. During the last few years, Russia introduced parity-based visa-free travel with two of its Northeast Asian neighbors – South Korea and Mongolia. Russian citizens can enter South Korea without visas for 60 days and Mongolia for up to 30 days. South Koreans and Mongols have the same right.In addition, Moscow has repeatedly hinted that it would like to sign a visa-free agreement with Japan. But Tokyo is not yet ready for the deal, largely because of the unresolved territorial dispute. We can also recall Russia’s longstanding, if unreciprocated, wish for a visa-free agreement with the EU. Incidentally, Russians are free to enter Europe in their private vehicles  (provided they have a Schengen visa), but there is no such option between Russia and China. Not particularly urgent discussions about how it would be nice to have a Russian-Chinese agreement on border crossing in private cars, at least for the border areas, have been going on ever since the 1990s, but there is still no solution. The result is paradoxical and even a bit indecent. We claim that China is our main strategic partner, practically an ally, but still keep it behind a visa barrier. At the same time, we have abolished visas for South Korea (a US ally) and are seeking visa-free arrangements with the EU and Japan (even closer US allies). 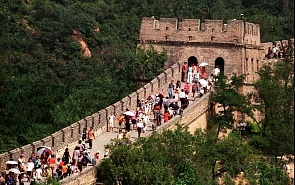 True, Russia and China allow visa-free travel for organized tourist groups numbering no fewer than five persons. A new agreement is being drafted, which will reduce the minimum size of tourist groups to three persons, and this is being presented as a major achievement. An e-visa option for foreigners, including Chinese, entering the Free Port of Vladivostok has been in effect since 2017. But all these are stopgaps and half-measures. The bigger picture is that Russia and China are still separated by a visa barrier. Even though the Chinese do not air their official position in public, there is little doubt that Beijing has nothing against abolishing visas with Russia. The West’s intrigues have also been a factor, of course. In the US and European mythology, Russian and Chinese interests are incompatible and China poses the main threat to Russia. Odd, but for all our distrust towards the West, many people in Russia willingly take this myth on faith. Russian experts and decision-makers are convinced that millions of Chinese eager to settle in the Russian Far East and Eastern Siberia will pour into Russia as soon as visas are abolished. How does Russia stand to benefit from abolishing visas for PRC citizens? First of all, it will be a symbolic act demonstrating that we really regard the PRC as our friend and partner rather than a potential threat. I think the Chinese will appreciate that. This step will not lead directly to rapid growth of investment (the shortage of Chinese investment in Russia is another well-known weak point in bilateral relations), but will create a better investment climate. For example, it will be easier for representatives of Chinese small and medium-sized businesses to travel to Russia and vice versa, something that should lead to a rise in joint business projects. Fully visa-free travel will be a powerful incentive for tourism. Today Chinese tourists in Russia are mostly lower middle-class, who come on visa-free group tours and stretch every renminbi. Wealthy Chinese tourists prefer to travel on their own and many of them are discouraged by the need to obtain a Russian visa. Abolishing visas with South Korea has swelled the ranks of South Korean tourists to the Russian Far East. Today Vladivostok is full of them. Visa-free travel with China will immediately boost the number of “quality” visitors from the PRC. Ending visas requirements for the Russian-Chinese border will also have an international political impact. As mentioned, many in the West are convinced that Russia and China are unable to cooperate in earnest, since they don’t trust each other. The strategic partnership between Moscow and Beijing, according to them, is a chimera. Visa-free travel will provide an important counterargument and will force Western capitals to take the burgeoning Eurasian alliance a lot more seriously. The Japanese, who have followed the state of Russian-Chinese relations closely for a long time, may mull it over and conclude that they too should bolster ties with Russia. It can’t be ruled out that Tokyo will become more amenable to abolishing visas for Russians. Abolishing visas for PRC citizens does not mean no control over their entry and stay. In any event, they will have to present their foreign travel passports at border checkpoints and their information will be entered in relevant databases. Russian law enforcement officials have a constantly improving arsenal of tools to track foreigners’ movements in Russia and take measures if someone abuses the system by overstaying, for example. Trespassers of this sort are unlikely to be numerous. Russia and China could sign a visa-free agreement for two or three years to see how it works. If the experiment is deemed unsuccessful, the agreement will not be extended. Simple as that. President Xi Jinping is expected to be the main guest at the Eastern Economic Forum  scheduled for September 11-13 on Russky Island in Vladivostok. The Xi-Putin meeting in the capital of the Russian Far East offers an ideal opportunity to announce their intention to pull down the visa wall.